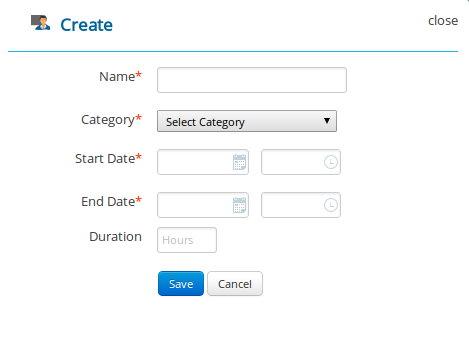 I have to create a form to track activity start and end time. Which format is more appropriate. While filing the form the time passes by and it gives a warning - "Start time should be greater than current time." Start time may be fixed but end time? I have another option can we track the activity according to start and end time only if it starts and ends on the same day. It seems to me to depend on the use of your Duration. If the Duration is of any importance, you will have to keep the same detail level in Start and End Times. It will also be less confusing to the user, if two controls that look the same, also work the same way. If the Duration needs seconds, then Start and End Times will need seconds. Otherwise not. I noticed that you seem to be rounding off 1:45 into 1, instead of 2. Also, you might do without the warning if you do not allow the date control to be able to select dates that are not valid. It obviously depends on the use of the duration. There is no way we can judge if seconds are relevant in your context. But display 2 minutes 0 seconds as just the '2 minutes' and 1 hour, 24 seconds as just '1 hour'. That looked quite natural. For many 'natural' uses, it is not interested in seconds if the duration you're looking at has the magnitude of hours. Cases where it is relevant to maintain precision include accounting-like applications, like your phone bill. The resolution of time that you use depends heavily on the application. For example, if you were measuring time for a race, you would definitely need seconds for both, and maybe even tenths of a second. Whereas if you were measuring billing hours for an attorney, you would probably only need minutes, and you would typically round up to sections of 15 minutes to an hour. Given your mockup with dates, I assume that you need to measure periods longer than a full day. In which case, hours and minutes are good enough for most applications. On a side note, if you don't need to measure anything longer than a day, I would suggest dropping the 'end date' field and simply working out the end date based on the times. If you started at 23:00 and ended at 05:00, you can work out that the end date is not the same as the start date. But this only works when you are sure the times will be under 24 hours in measurement. Given that you have dates i.e. you are expecting that the start and end will be on different days, I would suggest that you don't bother with seconds. Then the question of whether hr:min or just hr, I would go with hr:min as it is more natural to select both rather than just the hour. However, if you want to optimise input times its obviously faster to just type the number of the hour. You have both an end time and a duration input - you don't need both. You could display the duration as an information field rather than a input. Go with start time HH:MM, unless, you have the ability to start an activity before it begins. Then it makes sense that you used seconds to measure. If you are inputting any activity after it has been performed, I see no point in inputting seconds (unless it's some competitive sports or something). Same thing with end time, unless your stop time is the actual stop time of your activity, it does not make sense to include seconds in measurements. A (IMO) more sensible way would be, ask for the duration rather than end time. If the user wants to be precise he will input seconds, else HH:MM and he's done. No need of two fields for the same thing (duration & end time). Another argument for duration in favor of end time is, even if the start time is not accurate, there is a good chance the user knows his duration, so rather than him calculating the end time based on the duration you are removing the middle step and making it easier. Not the answer you're looking for? Browse other questions tagged forms usability time or ask your own question. Do I really need to show an end date if my event goes past midnight? Isn't this implied? How display multiple date fields inside a form?